I thought I would stop by to share a couple of cards with you. The first one is one I just made for fun...I fell in love with this image and knew the sentiment I wanted but didn't have it amongst my stash or stamps so I printed it out for myself. I used old papers and goodies....and twill ribbon from RRR that I tea stained. I am really loving the yellow during this time of the year....a bit of sunshine brought inside. 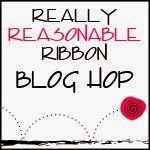 RRR ribbon storage ideas week!